Every year New Yorkers look forward to Macy’s Pet-Acular, an Easter bonnet parade for dogs. 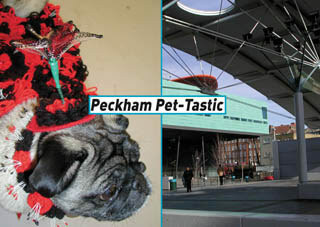 In 2004, Londoners may look forward to Peckham Pet-Tastic, a fancy dress picnic for dogs and their owners. The glamourous New York lifestyle will be arriving in the heart of Peckham. When Rachael House saw Macy’s Pet-Acular in 2001, she knew that this was the best thing she had ever seen, and she had to bring a version to Peckham, South London. Three years later, with the kind permission of Southwark Council, her dream is about to come true. On Saturday May 1st, the beautiful architecture of Peckham Square will be the venue for Peckham Pet-Tastic, an event for dog lovers everywhere. Dog owners are invited to dress up their dogs, clip on their leads, and bring them along for some snacks, to show off and to compare outfits. Peckham Pet-Tastic is an opportunity to celebrate our pets and the vibrancy of South London. It promises to be a wonderful Bank Holiday afternoon out for everyone. Rachael House has previously organised live art events at The Centre of Attention, Duckie at The Royal Vauxhall Tavern and Howl in Belfast, amongst others. She is a co-director of Space Station Sixty-Five, an artist run space in East Dulwich. Before studying Fine Art at Central Saint Martins she made small press comics and was a youth worker in Peckham. Peckham Pet-Tastic is a Space Station Sixty-Five Satellite event by Rachael House.